Technology has changed the game for small businesses. Where small department size was once a hindrance, it can now be an advantage. Where small, newly-established infrastructures used to mean less stability, they can now mean more agility and flexibility. The right technology can turn a small business from a niche player in an industry to a major threat to established enterprise companies. Organizing, supporting, and enabling a small business with a CRM solution like Salesforce can help that SMB punch well above its weight and harness the selling power previously reserved only for big business. The underdog mentality and drive to create something new means small business sales teams are constantly pushing themselves to reach the highest levels of productivity. They work just a little bit harder, and put in just a little bit more work than the competition. 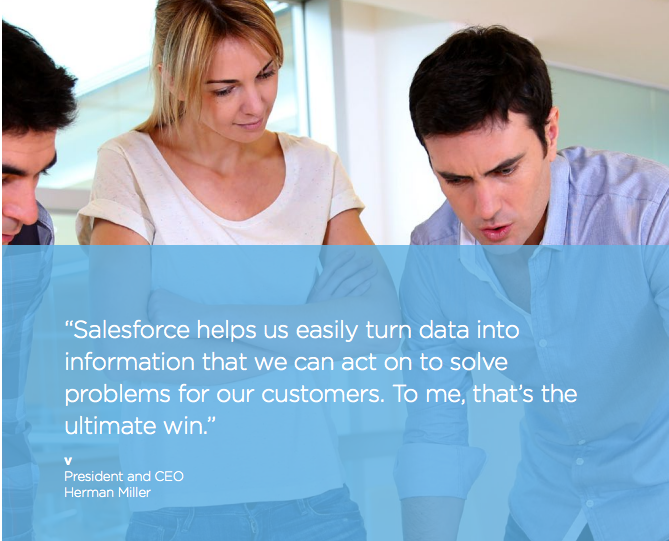 Salesforce is designed to enhance a team’s productivity and make all of that hard work pay dividends. By providing a central hub for all of your most important tools, enabling you to scale collaboration and communication, and allowing you to work the way you want, Salesforce can turn any small business into a well-oiled machine. Even as technology removes many of small businesses’ traditional barriers to entry, small businesses still have to compete with the massive research and development budgets of larger competitors. Salesforce can provide the R&D budget you need to keep innovating. Salesforce is leading the industry in innovation and puts its customers on the cutting edge with new products and consistent updates. Mobile-First Mobile is more than a passing fad. Companies in every industry are realizing the power of mobility and are scrambling to deliver the mobile functionality their users demand. For small businesses, growing your business, enhancing productivity, and driving innovation all lead to one thing: scaling up. In order to take the next step forward, small businesses need to have the right infrastructure and tools in place. Traditionally, this can be an arduous process, requiring massive investments in time and resources. Building out infrastructure is an infamously time-consuming process that requires massive financial investment. But Salesforce changes that. Salesforce is based in the cloud, which means no expensive infrastructure build outs. Simply add additional users and you are ready to go! Salesforce’s massive ecosystem of products also makes it easy to add features and tools in minutes. All your tools integrate into one user interface, saving you time and maximizing efficiency.